She was six years old when I first met her on the beach near where I live. I drive to this beach, a distance of three or four miles, whenever the world begins to close in on me. She was building a sand castle or something and looked up, her eyes as blue as the sea. "Hello," she said. I answered with a nod, not really in the mood to bother with a small child. "I'm building," she said. "I see that. What is it?" I asked, not caring. "Oh, I don't know. I just like the feel of the sand." That sounds good, I thought, and slipped off my shoes. A sandpiper glided by. "That's a joy," the child said. "It's what?" "It's a joy. My mama says sandpipers come to bring us joy." The bird went glissading down the beach. "Good-bye, joy," I muttered to myself, "hello, pain," and turned to walk on. I was depressed; my life seemed completely out of balance. "What's your name?" She wouldn't give up. "Ruth," I answered. "I'm Ruth Peterson." "Mine's Windy." It sounded like Windy. "And I'm six." Hi, Windy." She giggled. "You're funny." she said. In spite of my gloom I laughed too and walked on. Her musical giggle followed me. "Come again, Mrs. P," she called. "We'll have another happy day." The days and weeks that followed belonged to others: a group of unruly Boy Scouts, PTA meetings, an ailing mother. The sun was shining one morning as I took my hands out of the dishwater. 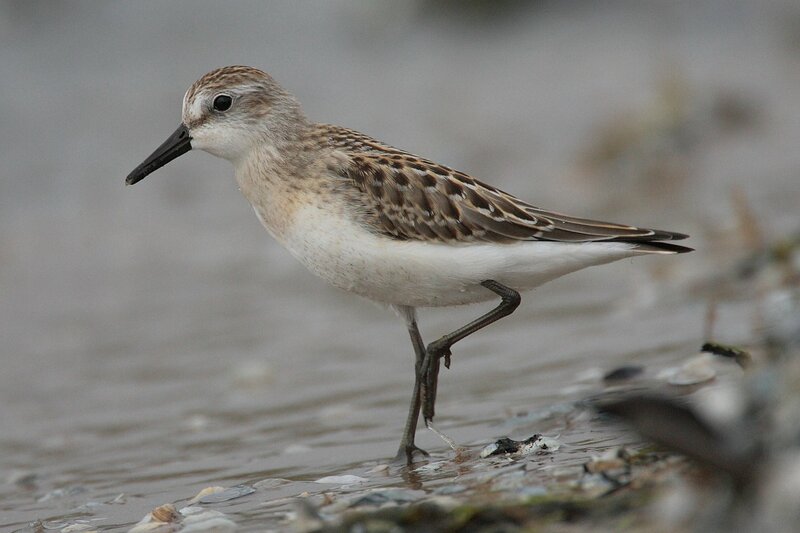 "I need a sandpiper," I said to myself, gathering up my coat. The never-changing balm of the seashore awaited me. The breeze was chilly, but I strode along, trying to recapture the serenity I needed. I had forgotten the child and was startled when she appeared. "Hello, Mrs. P," she said. "Do you want to play?" "What did you have in mind?" I asked, with a twinge of annoyance. "I don't know. You say." "How about charades?" I asked sarcastically. The tinkling laughter burst forth again. "I don't know what that is." "Then let's just walk." Looking at her, I noticed the delicate fairness of her face. "Where do you live?" I asked. "Over there." She pointed toward a row of summer cottages. Strange, I thought, in winter. "Where do you go to school?" "I don't go to school. Mommy says we're on vacation." She chattered little-girl talk as we strolled up the beach, but my mind was on other things. When I left for home, Windy said it had been a happy day. Feeling surprisingly better, I smiled at her and agreed. Three weeks later, I rushed to my beach in a state of near panic. I was in no mood even to greet Windy. I thought I saw her mother on the porch and felt like demanding she keep her child at home. "Look, if you don't mind," I said crossly when Windy caught up with me, "I'd rather be alone today." She seemed unusually pale and out of breath. "Why?" she asked. I turned on her and shouted, "Because my mother died!" -- and thought, my God, why was I saying this to a little child? "Oh," she said quietly, "then this is a bad day." "Yes, and yesterday and the day before that and -- oh go away!" "Did it hurt?" "Did what hurt?" I was exasperated with her, with myself. "When she died?" "Of course it hurt!" I snapped, misunderstanding, wrapped up in myself. I strode off. A month or so after that, when I next went to the beach, she wasn't there. Feeling guilty, ashamed and admitting to myself I missed her, I went up to the cottage after my walk and knocked at the door. A drawn-looking young woman with honey-colored hair opened the door. "Hello," I said. "I'm Ruth Peterson. I missed your little girl today and wondered where she was." "Oh yes, Mrs. Peterson, please come in." "Wendy talked of you so much. I'm afraid I allowed her to bother you. If she was a nuisance, please accept my apologies." "Not at all -- she's a delightful child," I said, suddenly realizing that I meant it. "Where is she?" "Wendy died last week, Mrs. Peterson. She had leukemia. Maybe she didn't tell you." Struck dumb, I groped for a chair. My breath caught. "She loved this beach; so when she asked to come, we couldn't say no. She seemed so much better here and had a lot of what she called happy days. But the last few weeks she declined rapidly..." Her voice faltered. "She left something for you ... if only I can find it. Could you wait a moment while I look?" I nodded stupidly, my mind racing for something, anything to say to this lovely young woman. Tears welled up in my eyes, and a heart that had almost forgotten how to love opened wide. I took Wendy's mother in my arms. "I'm sorry, I'm sorry, I'm so sorry," I muttered over and over, and we wept together. The precious little picture is framed now and hangs in my study. Six words -- one for each year of her life -- that speak to me of inner harmony, courage, undemanding love. A gift from a child with sea-blue eyes and hair the color of sand -- who taught me the gift of love.